There are things guys don’t want to know about. How much you wish he’d finally propose. If he knew how you REALLY felt? Or at least that’s how common dating wisdom goes. Keep some things to yourself. He doesn’t need to know you’ve doodled your first name and his last name—or dotted the i’s with love hearts. He doesn’t need to know you stay up late worrying about whether he’ll still feel the same way about you in a year. He doesn’t need to know you stand in front of the mirror picking apart how you look and wishing his last girlfriend hadn’t been so much younger/blonder/whatever than you. He doesn’t need to know you’re feeling sad under your happy face. And that’s how it’s always been done. Ever since dating was invented. But never needy, emotional, complex, or difficult. Because guys hate difficult. They want easy. Not just because women feel they have to hide their true selves. But also because men don’t get a chance to rise to the occasion. 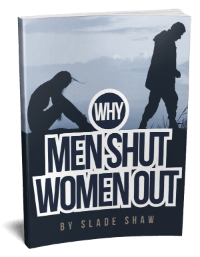 Confronting difficult, messy emotions gives us men the opportunity to learn ways of supporting you. It’s a gift to be trusted with a woman’s inner world. Yes, it’s challenging. But that’s how guys mature into men who can partner with a woman, rather than just have a good time. A lot of guys just want a happy, easy-going woman. She requires nothing from them. They don’t have to work at the relationship. If she’s upset about something, that’s her problem. Those men aren’t great at relationships. They’re even worse at marriages. A man who’s looking for conflict-free happiness should probably stick to dating. Marriage involves problems, conflicts, and LOTS of messy emotions. The fun part is growing to meet those challenges! 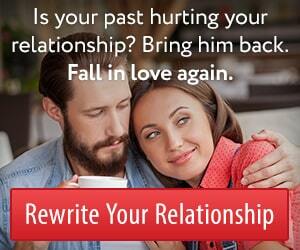 And that’s where conventional dating advice goes awry. But you may find yourself attracting “boy-men” who haven’t grown past their fantasy of a beautiful woman with no needs and no desires other than to have fun. This is where letting him see the REAL YOU comes in. See how he responds when you reveal something inconvenient to him. Can he handle the fact that you have complicated emotions, insecurities, and maybe even a personal problem or two? If so, then great! It shows he’s grown-up enough to realize we ALL have messy lives. But maybe you’ve been burned in the past because you were too open. You wish you wouldn’t have been so honest. You know that what you said drove him off. 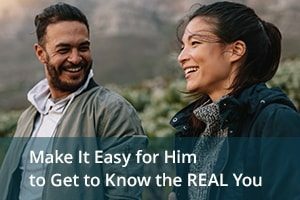 If so, here’s a technique that will help you share your personal truth in a way that awakens a man’s desire to be your hero. You can’t share your inner world with a man the same way you do it with your best girlfriends. When you share something you’re going through with one of your girlfriends, she gets you…sometimes instantly. She knows how to respond. But when you share the same thing with a man, he doesn’t know what you’re asking of him. Are you asking him to fix it? Are you expecting him to respond in a certain way? Will you get angry at him if he says the wrong thing? It’s stressful. He feels set up for failure. So set him up for success instead. Don’t just blurt out your truth. Think about what you want from him first. Then share your feelings in a way that makes it clear what he should do next. Let’s take the example of how you might tell him you want marriage and a family. What do you want him to DO with that information? Is it an ultimatum? Either he wants the same thing as you, or it’s over? Said like that, your disclosure could effectively end things between you. Maybe instead what you want is to clarify your relationship goals and find out his. There’s nothing scary about that. You’re not making any assumptions. He may not be right for you. You’re also giving him an opening to respond without putting himself in danger. You’re not asking whether or not he AGREES with you. You just want to know his thoughts. That makes his life easy. It makes him perceive you as someone who’s easy to be with, even though you’re unusually transparent. As I write in His Secret Obsession.